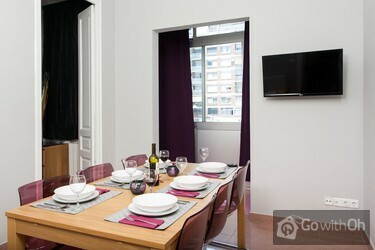 This is one of our best located Barcelona vacation rentals with direct views to the Sagrada Familia. If you are looking for a large vacation apartment, this bright holiday rental of 85 sqm for 5 people with three bedrooms is perfect. It has been decorated with style and modern furnishings and is located on a first floor of a historic building with lift. You will find a lovely living room with a balcony to the street, a TV and a comfortable sofa. Right next to it is the cozy dining room with a large table and six chairs. Have breakfast and watch the colors on the façade of Sagrada Familia. There are two bathrooms, one with a bathtub and another one with a shower. 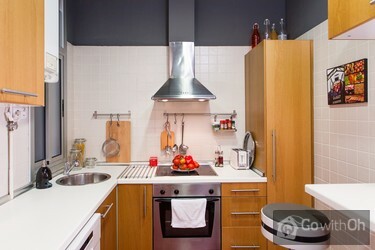 You can prepare nice meals in the well-equipped and large kitchen. This holiday rental is ideal for a group or family and if you are a bigger group the owner is also able to provide other vacation apartments in the same building. 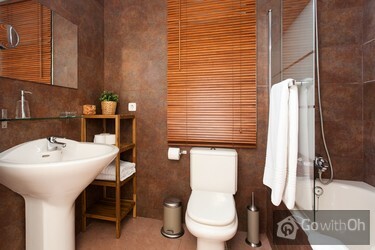 This vacation apartment is located within walking distance to the Sagrada Familia, in an area well connected by public transport. There are also bus lines on Valencia stree and you are close to the Sagrada Familia metro stop with several lines that will take you anywhere in the city (lines 2 and 5). After 22:00h, extra cost of 30. Check in on the 24th, 25th, 26th, 31st December and 1st January, extra cost of 30. (These charges are cumulative). Before 08:00h, extra cost of 30. Departures after 11.00h, on request and subject to availability, extra cost of 50. The owner possesses other apartments in the same building. For more information, please contact our Customer Service department. Nous avons passé une semaine de vacances en famille dans cet appartement où nous nous sommes sentis tout de suite très bien. Le logement vient d'être rénové ce qui explique l'absence de commentaire. Appartement très fonctionnel, avec une décoration de très bon goût, un mobilier et de la ...literie de qualité. Bien qu'il soit situé dans un quartier très animé, avec toutes les commodités à proximité (commerces, transports...,) l'isolation du logement (double vitrage) permet de profiter des vacances en ville tout en se reposant. Le propriétaire est charmant, sympathique et correcte (aucun souci lors des transactions). Pour conclure, ce logement nous a permis de passer d'agréables vacances et de découvrir Barcelone; Nous vous recommandons sans hésiter cet appartement. Tout s'est bien passé! Nous y retournerons! This place is absolutely perfect. I have never booked an apartment abroad before and a lot of others I looked at never replied to any of my questions. However the owner at this apartment got back in touch and answered all my questions within 24 hours. I was also worried because our plane was delayed... and we didn't get to the apartment until midnight, but there was someone waiting there and we got everything sorted quickly and efficiently. The apartment was beautiful. Completely spotless, super clean, decorated nicely and had everything we needed. There are remote control fans in all the bedrooms which were really useful. 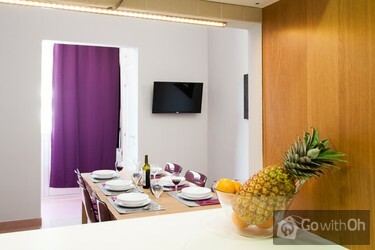 We would have our morning breakfast in the dining room and look out the window at the Sagrada Familia. Location is perfect for a city trip. Would stay here again for sure! L'appartement est conforme aux photos, propre et très agréable, proche de deux lignes de métro à deux pas de là ... Vous pouvez admirer la Sagrada chaque fois que vous allez prendre le métro plus un petit bout depuis le balcon de l'appartement. D. parle espagnol mais se débrouille très bien ...en anglais donc pas de barrière avec les langues, on arrive très bien à se comprendre. Il est très agréable. Son collègue qui a supervisé notre check-out aussi ! Et on a aimé leur côté original !!! En résumé, aucune vilaine surprise !!! On y retournera car on veut encore découvrir Barcelona qui est une ville magnifique !!! Appartment was perfectly clean and had everything we needed. There were 4 of us staying and we had loads of room. Would be a little bit of a squeeze for 7. Some of the bars and restaurants around were a little touristy, but overall location is excellent with a metro stop just around the corner. 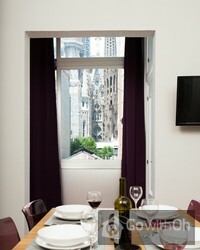 The apartment is in a great location with an almost perfect view of the Sagrada Familia from the dining room window. 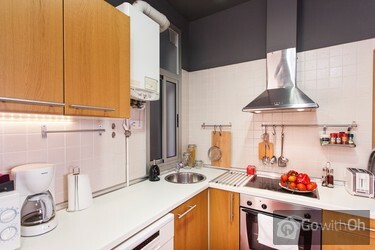 Amazing!Very close to supermarkets, local shops, restaurants and metro station. We had no problem eating out or buying food to eat at the apartment and in easy access to other areas ...of barcelona (on foot and metro).We travelled with 2 small children (4 and 2 years) and both really enjoyed staying in the apartment. It was very clean and had all of the facilities we needed.The only issues we had were with the wifi internet, which was very intermittent. Going from 15mbit to 0.3mbit on regular occasions. Also, getting any internet access in the bedroom at the far end of the apartment was impossible.All in all we really enjoyed our stay! Great location with easy access to the metro. The owner was very accommodating in relation to our arrival time and very friendly too. Das Beste ist der direkte Blick vom Esszimmer auf die Sagrada Familia. Die Wohnung entspricht der Beschreibung. Wir waren sehr zufrieden. 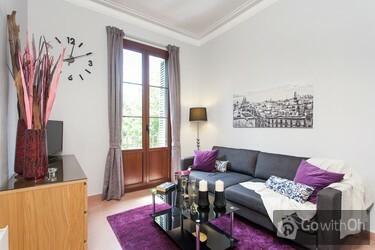 A 2 pas de la Sagrada Familia et du métro, appartement très agréable et très calme.Propriétaire accueillant. 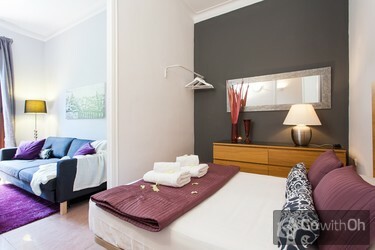 The apartment was lovely, we really enjoyed our time here and would recommend it to others. Die Wohnung war Klasse! Wir waren ganz positiv überrascht! Eravamo 7 amici e siamo rimasti a Barcellona per 10 giorni. L'appartamento è perfettamente ubicato nel centro della cittá a due passi dalla Sagrada Familia. La vista dalla terrazza della struttura è sicuramente una delle cose migliori dell'appartamento. L'alloggio era esattamente come ce lo ...aspettavamo. L'unica cosa che possiamo diee è che alcune parti della casa erano difettate (es.mattonella dondolante). Dovete sempre guardare e comunicare in questi casi. Tuute le parti migliori della cittá sono raggiungibili in metro senza alcun tipo di problema. les + calme fenêtre fermée et la nuit. 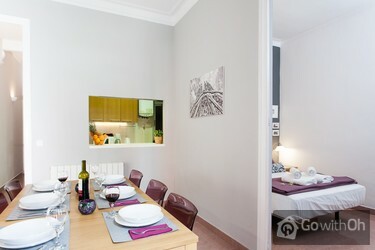 Proximité du metro Sagrada Familia.Les - cet appartement mériterait un meilleur entretien (Deuxième WC en état de marche. carreaux du sol décollé - fixation douchette)Il faudrait au moins un rouleau de papier toilette supplémentaire (pour 3 personnes)). Me encantó el apartamento. Buena ubicación, bien acondicionado y muy bonito. Lo único que para ir con niños pequeños, ascensor hay que cogerlo bajando algo de escaleras, y con los carritos estos detalles luego se hace un poco incómoda la estancia. Por lo demás, perfecto! Our stay was wonderful. The apartment was very clean and comfortable. Very close to many good restaurant and attractions. il proprietario ci ha accolto molto gentilmente e fatto entrare anche prima rispetto al check in .L'appartamento era esattamente come lo avevamo visto dalle foto .appartamento pulitissimo molto spazioso anche grande per noi che eravamo in 3. Appartamento confortevole e comodo, siamo stati molto contenti. Gentile cliente, la ringraziamo per i suoi commenti che saremo lieti di considerare. Il proprietario ci conferma di aver controllato la connessione internet e garantisce il buon funzionamento. L'appartamento è esattamente come indicato nella descrizione e come nelle foto pubblicate. Perfetto per una famiglia da quattro a sei persone (noi eravamo in quattro), in posizione ottimale per visitare le principali attrazioni della città (è a due passi dalla Sagrada Familia e a pochi ...chilometri dalle più famose case di Gaudì), ben attrezzato e molto tranquillo. Per l'auto c'è un parcheggio sotterraneo vicinissimo e molto comodo. Sotto casa c'è un piccolo negozio di frutta e verdura sempre aperto e appena girato l'angolo un piccolo supermercato. Il proprietario ci ha accolto con cortesia e si è mostrato disponibile. Lo consiglierei senza esitazione. Sehr schöne, gut gelegene Wohnung mit hochwertiger Ausstattung. Extrem freundliche Kontaktperson. Top-Lage. Zauberhafter Ausblick auf die Sagrada Famillia. The location is very close to the metro, and it's ok for maxim 3 nights. The rooms of the aparment where very small and after 22:00 o'clock you have to speak in silence becaure there are neighbors. If you go in the winter I recomand you to have good pijamas because is very cold in the apartment. The price id very good!